I’m a bit late with my New Year wishes but oh well. Been doing some work on the house, more so than the dogs. But I’m still working with them and loving them. 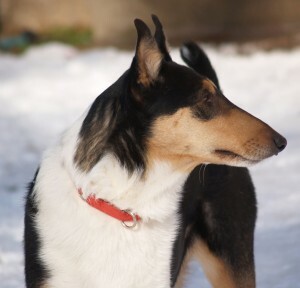 And we still have Titus, the smooth tri collie boy. He is amazing and we are already head over heels in love with him. I need more computer memory to put all the pictures I have of all our dogs on disk. This is really why we just can’t foster anymore. Especially my favorite breed. We just fall for them too hard. He’s up on Petfinder now though, so hopefully a really good family will come along that will be more perfect for him than we are. I tell myself he’ll get more attention someplace else. Even though I know I’d probably try to do agility with him if he stayed. He’s only 3.5 years old so he’s young and in really good shape. Hrmph. So no decisions yet. He’s a doll and we adore him. Chase doesn’t like him but that’s typical. Levi doesn’t really care about him which is odd. I think it’s because Titus is very Omega and doesn’t pose a threat to Levi at all. So that’s good. Tatum and Jet and Titus just play and play and play. They get along really well. Dangit, we are getting too soft in our old age. There was a time when I didn’t fall in love with any of the fosters. Oh well…. Fostering dogs are awfully difficult. My mother fostered dogs when we were kids and it was really hard. We would get really attached to them, but we always made sure they went to good homes.. Hopefully Titus finds a forever home… He looks stunning! .-= Sean Green´s last blog ..Picking the best dog food =-. Titus is such a handsome boy. I’m glad that he’s getting along so well with everybody (Chase excluded), but I also know how hard that makes it to think about letting him go. 😛 Sorry! .-= Marie´s last blog ..First Project of the Year, DONE! =-. Since you’re not a do follow blog; you should probably remove your name from the list of do follow blogs. That’s how I made my way here to your blog. Though yes I am here because you were listed as a do follow. I don’t spam, and actually enjoying reading, commenting, and getting to know fellow bloggers; so since I’m a do follow naturally it make sense for me to look for others who are as well. Titus is the name of one of the dogs across the street from me; and just last week met a woman who named her new dog that. Funny thing, until then never had run across a dog with that name. .-= sandy´s last blog ..Grand Canyon, Arizona =-. Actually I am a do follow blog but not by default… I get way too much spam so I installed Lucia’s Linky Love plugin. Poeple have to have 10 comments before they get a dofollow on their comment link. Thanks for your visit. I was thinking about getting a border collie, as a child I had a collie mix that was wonderful. Titus seems like a good boy.